Women continue to struggle to break in as officials at the highest levels of sports. espnW examines the sports showing progress and those lagging far behind. When Billie Jean King watches a tennis match and sees a blown call, she hopes the linesperson at fault is not a woman. Although she has led the gender-equity charge in tennis since defeating Bobby Riggs in the Battle of the Sexes, she hears people speak openly about female officials. "They don't trust the women; they just don't," King said. Tennis has been the most progressive of sports when it comes to having women make the call in officiating. Women such as Eileen Leonard, Anita Shukow, Florence Blanchard and Judy Popkin have been officiating men's matches as far back as the 1960s. But tennis is the exception to the rule when it comes to women and major sports officiating. Even though female participation in all levels of amateur and professional sports has continued to grow in the 39 years since the passage of Title IX, it is rare to have women as professional officials. Richard Kaufman, the USTA's director of officials, said tennis has had female officials since the 1800s. At the 2010 U.S. Open, 33 percent of the chair umpires in the men's main draw were women. "Look at basketball, they have one, football none, baseball none, hockey has none -- we've been promoting female officials," Kaufman said. The numbers are indeed slim. No women call NFL, Major League Baseball or NHL games. The NBA has one female official, Violet Palmer. The elite levels of professional and Olympic soccer are opening their doors to women, with the majority of the opportunities coming in the women's game. The characteristics of an excellent official as described by those at the top of each sport include knowledge of the rules, a thick skin, impartiality -- qualities that cannot be claimed solely by either gender. From tennis to football to baseball, leagues say they want the best person for the job, yet that person is nearly always male. Some sports have done better than others. In the NBA, Palmer has established herself as a credible and hard-nosed referee since her start in the WNBA in 1997. The NBA hires officials directly from the Developmental League, which last year had nine women on a staff of 41. In the NFL, women in the training pipeline could be called up within a few years. Sarah Thomas has been officiating Conference USA football games since 2007, enough time for the NFL to start evaluating her readiness for the professional game. Yet in other sports, progress for women has either stagnated or deteriorated. In hockey, Heather McDaniel, the lone woman who was a minor league hockey official in the '90s, is shocked to see that no one followed in her footsteps. "It's hard to believe it's been 15-17 years since I broke into the pro ranks -- that's a long time to not have somebody follow," she said. Women have flocked to play hockey at the high school and collegiate level, but of the 2,800 registered female officials in North America today, just a few have worked the men's game, and none at a higher level than juniors. In baseball, the number of women applying to umpire schools was low to begin with and has continued to drop. Even those who have some success, like female umpire Perry Barber, don't feel there is any progress. The difference in whether a league has women in the system seems to come down to a professional league's willingness to attract and train prospects, then allow competition for jobs on an even playing field. King said that if you aren't creating an opportunity for women to come through the door, it is hard for any woman who wants to officiate to break those barriers on her own. "You have to have a system organized," King said. "You've got to put forward a policy and say, 'We're going to train people.'" When the WNBA was starting in 1997, then-commissioner Val Ackerman found that the NBA referees were under a strict contract and the new league would have to develop its own pool. So she went to the collegiate ranks to find officials. "Our philosophy was we want the best person for the job, but we want to make opportunities available to the qualified women," Ackerman said. The argument that women can't officiate or coach because they never played the game has become less and less of a barrier, as women grow up playing hockey, basketball, softball and even football. The NFL held a rules clinic for a women's team, the Pittsburgh Passion, and the NFL's head of officials, Carl Johnson, hopes to eventually find some of those women starting up the officiating ladder by working high school games. "Our goal is to get the best people working this game," he said. Johnson added that there is nothing about being a man or woman that would lead him to assume a level of aptitude for the job. 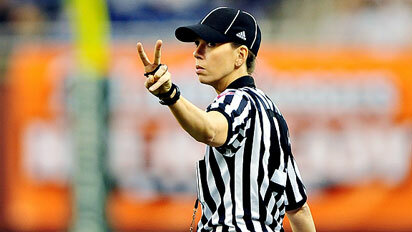 Yet in many sports, men officiate for both genders, while women without much exception officiate only their own games. In 2008, a Kansas religious school even refused to let Michelle Campbell officiate a boys' high school basketball game at St. Mary's Academy because of her gender. To King, the barriers will start to fall when people become used to seeing women in positions of authority as officials in games. For now, it is still unusual. But when the first female NFL official takes the field in the next year or so -- as Johnson predicts she will -- it will cause a stir. The novelty should not last long if other female officials follow. "You'd think by now women would have been in these sports," King said. "But until you have a critical mass of women doing these sports, it's going to be this way."